You mentioned that you're thinking of attempting to grow much of your own animal feed. I guess you're talking about not just the cows, but also your pigs? In your earlier posts however, I recall that you generally haven't been particularly fond of this approach for your farm. 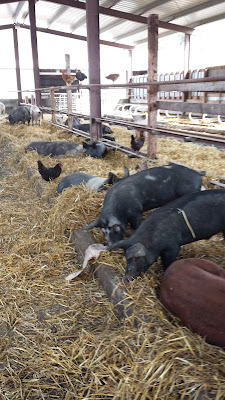 I think the rationale was that it simply wouldn't be worth the immense additional effort to plant, cultivate, harvest & maintain the pastures/crops required to feed the pigs....especially when compared to how cheaply grain can be purchased. Besides the huge amount of labour involved, there is also the costs of buying (or hiring) the appropriate machinery that would be needed. " My thinking hasn't changed, but my circumstances have. I've been farming on a very small number of acres with a large number of animals per acre. That system worked fine with the supplemental food I was able to get through basically industrial foraging: Discarded food, mostly produce, provided the bulk of the calories. I did that for two reasons; one, I could get the food for a lower cost than equivalent feed, and two, it allowed me to carry more animals than I had acres. It worked well for 7 years, and then my food supply got disrupted. The fellow running the recycling center that I drew most of my food from moved 60 miles further away, and then got weird about parceling out the food -- he liked having multiple farms picking up his food, but he really didn't' have the volume to support all of the farms that he attracted. So my feed situation got unstable. I dealt with it a while by basically calling the guy every morning, but it soon became clear that he either didn't have the volume I wanted any more, or just plain wasn't able or wasn't willing to give me that volume because he was sending it to other farms. Either way it was a problem. Over the last 3 months I've found other sources, and we're back up to about half the volume we used to get, but in the meantime I've had to purchase feed, and feed isn't cheap around here. $540 a ton, and we go through a ton a week if I'm feeding complete ration feed only. My circumstances have changed: I used to be in a situation where I had plenty of food that was relatively cheap, and not many acres. Now I'm at a place where I have a lot of acres, and food is relatively expensive. And the acres I do have are pretty darned good ground. My long-term goal is to find a type of farming that I enjoy, is profitable, and fits with this area -- both in terms of soil, weather, crops and so on. I want to grow things on my farm that fit well with where I am. 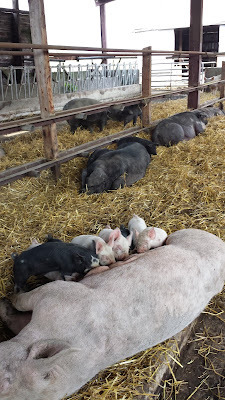 What you said is correct: it is more effort to plant, cultivate, harvest and maintain pastures/crops to feed the pigs -- due to limited acres, I couldn't raise near enough feed to make it worth while. But now, with 94 acres available, I have enough land for the economies of scale to start making producing my own feed possible. And I've also found a farmer in this area who does custom work (cultivating, planting, harvesting) for a reasonable hourly rate -- so for those speculative crops I don't have to buy the equipment, I can hire him in, try it out, and if it works out and pencils out, THEN buy the equipment. The first thing that I've been exploring this year is growing corn without spraying down the weeds; I'd say that the sweet corn crop was pretty much a mess, but it provided a good learning opportunity, and i'm going to try it again next year with what I learned this year. Some of this I'll be planting this fall; some will be next spring and some won't be until may of next year (sweet corn, for instance). Whenever I write about an official, as a matter of policy, I send an email to whomever I wrote about with a link to the blog entry, and an invitation to read what I've written and to correct me about any particular that I got wrong. I want to make sure that I am accurately reporting their position. Part of the stated mission of ecology is to educate the public on environmental issues, and you see many references to education throughout their literature and website. Since that's true, I think it's appropriate to ask Ecology to clarify their position and policies related to this, or any other, complaint. You have misinterpreted the powerpoint presentation. What the statute states is that we have the right to access properties that we suspect are polluting, but we do not have the ability to obtain warrants, and I never stated nor implied to you that we have access to your property without your explicit permission. In fact, I openly stated to you that we would by no means enter any persons property without their explicit permission. This has been longstanding agency policy and to my knowledge, no Ecology employee would ever think of entering a property without owner permission. The powerpoint slide captures this..."
If you believe you have the right to access, why would you need a warrant? If you have the right to access but are denied, what is your recourse? I'm sure that ecology has a policy. I'd like you to state what it is. I've also asked him to identify the two staff members who accompanied him on the visit with name and title so that I can properly complete the public disclosure requests for those individuals as well. I have not yet received a reply to this email, but I'm sure that it's coming soon. Getting ready to use this new seeder for the first time. It's designed to lay down small seeds -- grass or alfalfa -- in a random pattern. unlike a seed drill that actually plants rows, this plants a fairly even sprinkling across the 10' face. The seeds are contained in the box at the top, and fall down between the two rollers, that push the seed into the dirt as they compact the seed bed. This seeder is meant to be used on well-prepared, loose ground, and after it passes over the ground is compacted and firmed up. It has a gauge on it calibrated to acres; so when the number on it clicks up, you've planted another acre. It reads around 1750 now; I expect to plant between 60 and 70 acres of ground this season with it; most of that will be a cover crop that I'll plan on tilling into the soil next year. I'll be planting some winter wheat, as well as grass seed and various mixes of grass, alfalfa and clover; a half acre of each as test plots to see how things do in this ground. It's not fast, but I'd like to have the best chance that things will work out, and so by taking it slow and watching carefully, I hope to waste as little money as I can as I plant bigger and bigger areas. 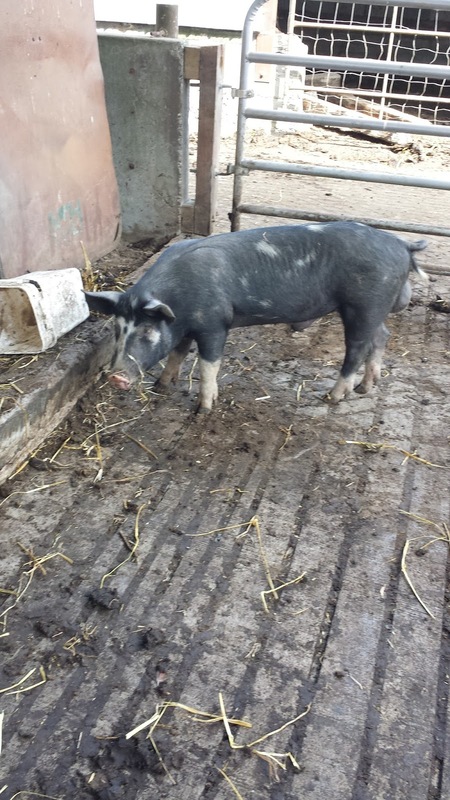 "Caller reports that Mr. King is rearing pigs in a wetland at the southwest corner of his property. This wetland flows to salmonid-bearing surface waters. 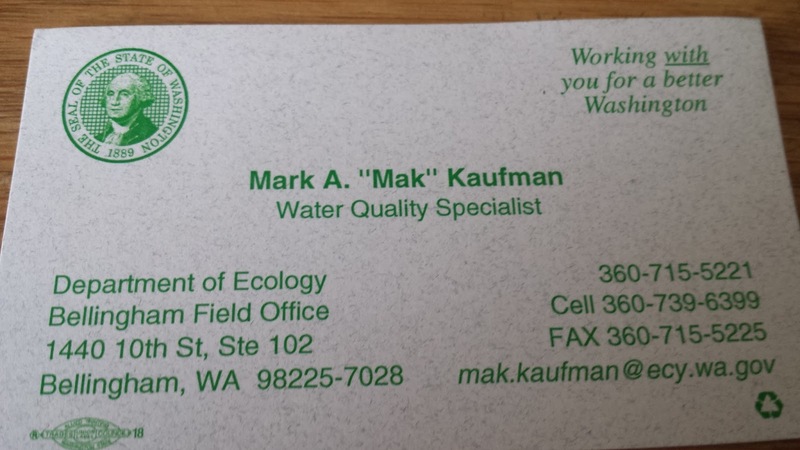 Caller thinks that this may be a violation of Washington states water pollution control law". So at my door were three department of ecology employees. Mark A "Mak" Kaufman was one of them. I was a little surprised that I didn't recognize any of them; I thought I knew all of the ecology folks in this area. He explained that he was here to investigate the complaint, and could he have access to my property to inspect? This is a guy who believes he has to right to enter without permission or warrant anyplace he chooses without any oversight by anyone other than his agency. That's a pretty broad set of powers for a state agency. Even the police organizations don't get inspection powers like this. Now if the law said something like "emergency situation" or "active pollution" or something, I'd have a little more sympathy -- Police officers get more rights to enter if something is actually happening that might require immediate access, but "all reasonable times" pretty much means whenever they want. That's more than a little bit astonishing. I did explain to Mr. Kaufman that allowing enforcement officers to inspect your property at their whim seems like a generally bad idea, and would he invite a police officer to inspect his car after a routine traffic stop? Mr. Kaufman surprised me by saying "Yes, I'd allow them to search my vehicle if they wished, I've got nothing to hide and I've broken no laws". So I asked him if I could quote him on that, and he said yes. Consider it done, Mark. Next time I've got to ask him if I can see the contents of his wallet and see what his answer is. If he's got no objection to random searches and has nothing to hide, there shouldn't be any problem, right? I had to laugh about that. With the wide discretion that is given police officers, it's my belief that an officer can find a violation of law in any car at any time. The department of ecology has similar wide discretion, and while they can compel me to allow access I'll only do it under protest. I have no interest in helping them in any way. He then showed me a folder and said "you have a history with the department of ecology", and had pictures of the excavator that was sunk by my neighbor. Yes, I've got a history with ecology Mr. Kaufman, but what does that have to do with this property or the conditions here? And what do the actions or events on my neighbors property have to do with me? He backpedaled on that one, "well, nothing..." . That's correct, Sir. Nothing at all. I listened to what they had to say, and then explained that while they may suspect that the area they are looking at is a wetland, those factors are not present. In general they are soil, vegetation and hydrology, and that the area in question didn't have all of those characteristics. There has been some clearing happening: Beavers did it! This is actually a key point when talking about wetlands. Having a wetland plant, or standing water, or hydric soils (iron-deficient soils) are all indicators of wetlands, but you need to have all three simultaneously during the growing season, which I do not. Since I'm in a river valley, the soils may be consistent with wetland, but wetland soil conditions can persist for hundreds of years after the water causing them subsides. Vegetation and presence of water during the growing season (defined in this area as soil temperatures in excess of 41F) are better indicators. I asked him if he'd already looked at the area in question. Yes, he said. and then what he'd seen? Two cows, he says. Ok. And how big an area are we talking about? "Between 2 and 3 acres". And I asked him if thought that the manure from two cows in a three acre area was sufficient for concern? Yes, he said. During the winter there may be runoff from that area. I suggested that he could confirm that by coming back in November, during the rainy season, and testing the water quality at any point he wished to see if my farm was producing any runoff or if there were levels of manure that would warrant concern. Well, he said, we have the duty to prevent pollution or potential pollution. So I asked him how many cows he'd seen as he drove up the valley to investigate this complaint? "Hundreds". And how many of those cows produce manure? "all of them". And they're all grazing the river bottom land, all of which could be described as wetland? Yes. Why aren't you investigating those farms? "We haven't received a complaint yet. Would you like to make a complaint? " That's where people get squeamish about this. Look, I'm all for the environment, but if these standards are truly important, and you directly witness hundreds of potential violations as you drive to investigate the complaint, shouldn't you be investigating all of them, too? Maybe its time to crank up the computer and just file a complaint about every single farm in this valley, from Puget sound to the cascades. This is a little ridiculous, honestly. We have sweeping water quality laws that are enforced in a random fashion. In this case, because a neighbor and I have a property line dispute. Mark, I think you have bigger fish to fry. But I'll look for you in November. I'll be right here. * We have spent $441,989,000 on salmon recovery projects since 2006. Half a BILLION dollars. If you'd like to see a map of the projects, you'll find it here. After spending close to a half-billion dollars on salmon recovery, we have seen one salmon run increase, one decrease, and all the others remain the same. Half a billion dollars. Washington state will spend any amount to "save the salmon", even if there is no discernible effect at all. The green mafia at work. Here's the report card on salmon recovery spending. The next time you see some agency crying about being short of money, remember this half a billion dollars. ** Note to self: rcw 90.48.090 is discussed in this practice guide written for Washington state agencies by the Washington state Attorney General for issues related to trying to gain access to private property for various administrative purposes. On page 56, It appears that the language used in this law is not sufficient to support the issuing of warrants for access, and that a warrant probably is required for access for purposes of inspection. It also states that agency employees can be liable for personal charges of trespass in the event of either a warrantless search or a search based on an invalid warrant. So while "it is the internal policy of the Department Of Ecology to seek permission to search, that may not be a kindness on their part -- it might be because their authority to search isn't as broad as they would like you to believe and agency employees are subject to trespass charges in the event that their access is denied/challenged. Helpful of the attorney general to write this up; your tax dollars at work. I grew a fine crop of weeds this year, and I'm actually pretty happy to find that the pigs like eating them. In the picture above you can see the "pig foraged" area to the left, and the untouched area to the right. I'll move that fence to the right to allow them to clear that area, too. What they don't eat they like to tear out of the ground and make beds of out. 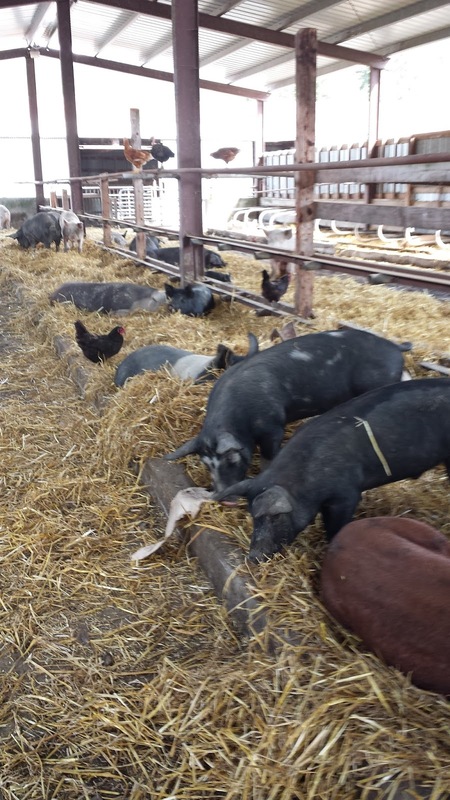 30 pigs clear about a half-acre a day. To the dirt if I leave them there. I'll be discing and planting this area with the winter cover crop when I move the pigs off of it. I'd like to have a lush, green, living cover on every inch of ground before the first frost. For the most part, that's going to be easy to do, but there are some areas that will be a bit of a challenge. One of those is around the horse barn. The dirt there is mostly sand, with some round river rocks. Not very much organic material, and stuff just doesn't grow there very well. To fix that i'm added manure and will use the power rake to remove the rocks and debris from there; leaving a nice seed bed. for this year I'll probably just lay down a pasture mix; grass will keep the soil in place during the winter rains, and will be a good holding pattern until I figure out what goes there for next year. This area is relatively close to the house; so I may make it the kitchen garden next year. I'll watch to see how the ground looks after I get done with this dirtwork. If you leave ground in this area fallow, you get both undesirable weeds and blackberry bushes. Blackberries are to the northwest what kudzu is to the south: A huge nuisance. So this is a little bit of a cross between farming and gardening and landscaping. Eliminating some plants in favor of others. 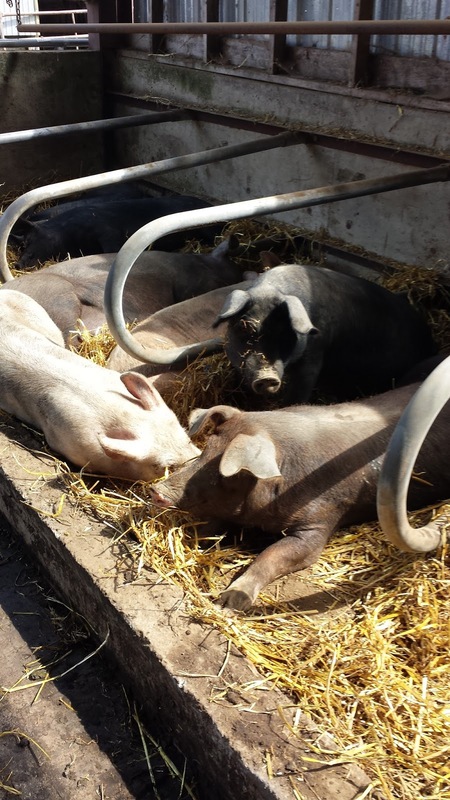 We have plenty of space in the barns for all of the animals we have; the basic challenge is to make them a little friendlier to the pigs. For most of the barns, this means cleaning out random stuff that's accumulated there during the previous owners tenure, and then removing some of the dairy support equipment to make more useful room for the pigs. Some of the dairy equipment has sharp edges or is rusted to the point where it won't stand up to a pig. 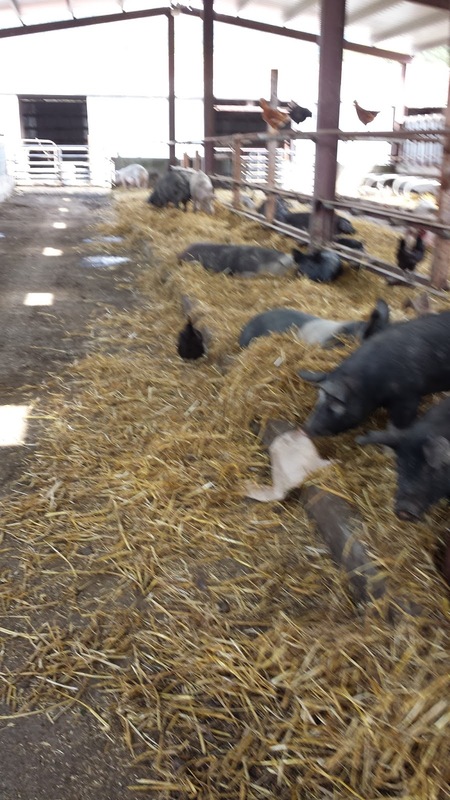 For their part, the pigs basically like the raised bedding areas; and tend to manure in the aisles, which makes cleaning the barn much easier. You run a scraper down the aisle, and in a single pass you're done. If you want to get fancy you can pressure wash, and get it really clean. We're using wheat straw as bedding; it comes from across the road; they combined 60 acres of wheat there a couple of weeks ago, and I was able to get the straw at a good price. It breaks down quickly, and provides some carbon for the nitrogen-rich manure. Better soil, faster. The barns are big and airy, which is nice. 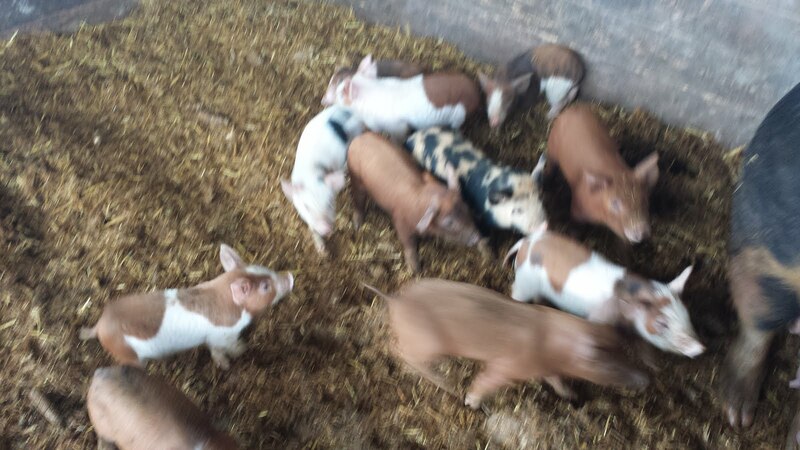 Keeps the bedding dry, but the pigs keep moving it. I haven't mentioned this, but I've been really happy to notice a large number of bats that live here. I've seen 50 or 60 of them, and I'm overjoyed because they eat the blood sucking insects that fly at night. I'd have a picture, but I can't get them to pose for me. I've actually had bats swoop down and take an insect inches from my face when I was wearing a headlamp. Not sure what it was -- probably a moth of some sort -- but it was pretty cool. They are adept flyers. Andrew, Over at GreenMachine, has a post about building bat houses with links to designs and plans. I am going to build a few and hope to see more bats around here. The more the merrier! Got the water test back a month or so ago, and the water tests clean for bacteria and nitrates, but has a higher-than-acceptable level of arsenic (acceptable is .010 and this well is at .012) and a higher than acceptable level of manganese. The water also has a faint sulfur smell, and it's pretty hard, and it has a fair bit of iron dissolved in it. There are all sorts of ways to treat the water. I'd like the house drinking water to be at acceptable levels for everything, but I don't have much experience with water systems or wells. So I asked the neighbors what they'd done; and my neighbor to the west, Vitaly, showed me his system and it gave me a basic capacity to shoot for in my system. I figured that a 12gpm output would work for the house. The previous owner of this property just drank the well water directly and never treated it; the water is safe to drink, but the standards for drinking water are getting tighter. The first thing I had to do was straighten out the plumbing in the well house. It was clear that the plumbing had been a multi-year project, and it was a bit of a mess. A couple of hours with $50 worth of fittings, and the well house plumbing was simplified. The pipes in this well house sweat quite a bit -- moisture in the air condenses when it hits the cold water pipes, and this masked a couple of small leaks, but even after fixing all of the leaks, the well house is going to be damp. The power panel wasn't in good shape, and the outlets weren't grounded, and generally speaking the wiring sucked. So $200 worth of parts and 6 hours and everything was in shape and, more importantly, water resistant for this wet environment. And properly grounded. After installing the water softener I'm having the water re-tested to see what effect the treatment has had on the other issues (iron, manganese, calcium carbonate, arsenic). What I'll probably do is install a reverse-osmosis system in the kitchen to supply the ice maker in the refrigerator and the kitchen sink with pure drinking water. The dishwasher and washing machine, toilets and faucets around the house are probably ok. Not sure what I want to do about the bathroom sinks. Brushing teeth, for instance... When I get the test back I'll figure out what sort of further treatment is needed. The well house itself is built of wood, and is probably 40 years old. The base of each of the 4 walls is rotten. It's been in a few floods, and its a wet building to begin with. I think that long-term I'll want to rebuild the well house on a concrete foundation with a drain and high enough to be out of the flood waters, which, on a record-flood year, are about 1' deep. The county says I can construct a building up to 400 square feet without a permit, so I'm good for remodeling my well house; no permit issues. More of a problem is the well house connection to the modern well. It's a freeze hazard; a couple of plastic pipes that are run 2' above the ground to the top of the well housing. I did talk to a well contractor about fixing that; he said he'd give me a bid and that was the last I heard of him. Guess I'll be calling another one. The new farm has a lot more acreage, and it's good ground. I have a realistic chance of being able to grow enough forage or crops on this ground to feed all of the animals that I raise; that's new to me. I've had to depend on outside food for the last 7 years -- and while it's been good, that supply is variable, and the suppliers can be a little arbitrary as to who they give the food to. So I'm going to concentrate on testing out various types of crops and forage to see what works on this ground, and what it takes to grow it. Selection of particular seeds for different characteristics, ground preparation and planting, planting timing and cultivation to reduce weeds, and then harvesting. I'll be working with all of those this year with several different crops. The farm buildings here will be reworked a bit to make them better for my operation. A particular concern is the big barn; the previous owner froze 40 cattle to death in this barn -- no sides and no shelter in the winter from the cold winds that blow down the valley from the mountains. So on the list are sides and insulation for this building, and probably reducing its capacity to what I'm able to use. Right now I'm using about 1/8th of this big barn. Monster was named because when he was a pup the cats decided that he was a monster. He could go anywhere they could (except when they climbed) and delighted in chasing them around and getting them to swat at him. He was a terrier through-and-through; I love the airedale breed because of their typical stubborn terrier sense of duty. When they put their mind to something it takes a lot to change it. He has been my constant companion for the last 12 years, the first to make it to the door for the new adventure; the first to jump onto the truck. He loves to sleep near the foot of the bed to make sure that he doesn't miss anything that I might do; any adventure he might come on, no matter how mundane. He has sired about 100 puppies that are all over the country now; in ones and twos, airedales for families that want the breed, or have fond memories of their old airedale. Some of his pups are in British Columbia, hunting bears and cougars; some are in Texas, hunting pigs. The airedales that I love are a working breed; sturdy frame, well muscled, deep in chest, keen eye, excellent nose. He has been all of that. He has been losing weight for the last 6 months, and I think that part of that is an old injury; I had to have his hip surgically repaired after a pig dislocated his leg, and while costly, it gave him another 8 years of running and barking and doing what he loved to do. I have appreciated the time with him. He has always been a food-centric dog; he would guard the food from the other dogs for hours, or days. He'd be the first on the scene with a sick pig. So much so that we called him "Dr. Monster" -- he was uncanny in being able to determine who would, and wouldn't, live, and he lived for the days when we slaughtered something. He is terrified of fireworks, but learned to run to gunshots -- seeing the gun come out was always a happy time for him. Something was going to die, and there would be blood and to Monster, that was a great day. For the last month he's been in the house; steadily dropping weight, having a hard time finding a comfortable position to sleep in, slowly losing ground. Aspirin and other medicines have made his time a little easier, but tonight it's clear that he's not going to get better. At some point in our lives we all will have to face our end, and farming has taught me that it is no kindness to prolong it. I used to go to heroic measures, but over the years I've found that as hard as it is, it's a kindness to go before the bitter end. So I dig a hole out in the field, leaving the fresh earth next to it, and when he sees me with the gun, he's happy. Something good is going to happen. I'm having a hard time keeping composure. I have to carry him out to the truck for the short drive, and I set him down next to the hole, and I tell him how much I've loved having him. And I do what a friend does. There are certain times of year that you see a surplus of a particular type of food. Hay, grain, salmon -- they all have their seasons. 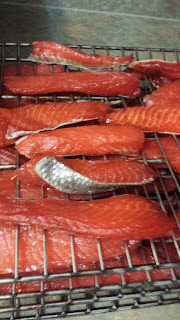 I particularly love smoked sockeye salmon, and I smoke 25lbs of it each year. I'll carefully seal each piece of salmon in an airtight bag, and they'll come out over the next 12 months as smoked salmon pate, and linguine with Smoked Salmon, and just plain old delicious smoked salmon. Slice the salmon into strips about 3/4" wide. I cut them into 6" pieces to make handling easier. Leave the skin on; it contains delicious oil that make the salmon even better, and will help keep the pieces together. Uniform pieces are what you're after so that they smoke at the same rate. In a clean, non-reactive bowl (stainless steel, glass, ceramic) put a layer of dry rub, and then a layer of fish, and then a layer of dry rub, making sure that all exposed salmon has a good coating. Coat the top with the dry rub. Put a plate on top of the packed bowl of fish, and put a weight on it; a glass jar of pickles works; you want a few pounds. This will press the liquid out of the fish as it cures. Make sure that your bowl has enough free space so that it won't overflow - put it on the bottom shelf of your refrigerator for 6 to 12 hours. About halfway through, pull it out, and mix up the pieces to ensure even coating, and then return to the refrigerator. After brining, rinse each piece off to remove excess salt and sugar, and then lay out to dry. You want it to dry to a slightly sticky texture; couple of hours. If you don't do this the smoke won't stick to the meat properly. 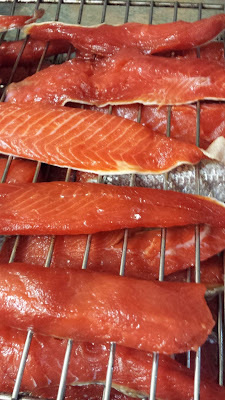 The salmon in the pictures above is air-drying just before being smoked. Smoked to perfection, ready for the freezer. Smoke at 150 degrees for 4-5 hours; check it about 2 hours in. 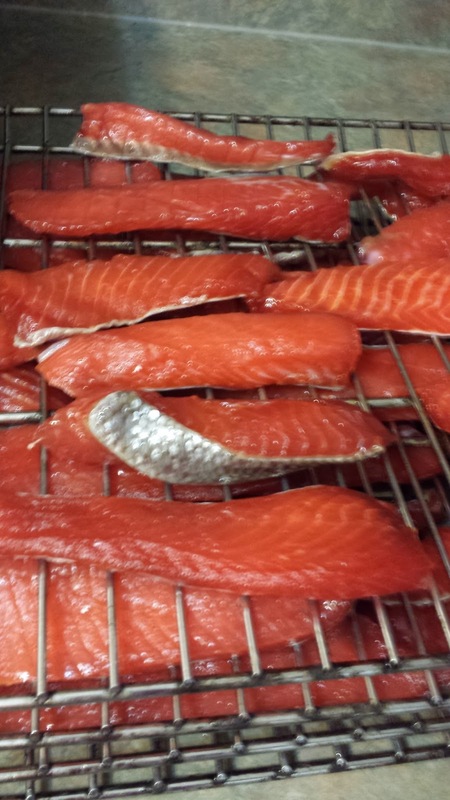 You want to see the salmon brown and sweating a little bit as it smokes. You'll want to play with the amount of smoke that you introduce to the fish, and the length of time for cooking. Longer cooks mean a firmer, drier smoked salmon. You can smoke in a BBQ, or a dedicated smoker, or in a cardboard box if you wish. I use this smoker and I've been happy with it, but I'm smoking all sorts of stuff over the course of a year; ribs, sausage, fish and the odd bit of cheese or vegetables. I got it from a clearance rack at a local sporting goods store. $4 an hour for farm work? Natures harmony is offering 9 month apprenticeships on their farm. You get to work 6 days a week, 4 hours a day, and it's paid! Well, sort of. Minimum wage is Georgia is $7.35/hour, and this position pays...$4.10/hour for the scheduled hours. And we all know that farm work doesn't work on a schedule, so the likely pay is lower than that. Oh yea; it's a split shift -- which means that it would be very, very difficult to find a job that you could work to supplement your $4 an hour wage. At least you only have to commit to 9 months of this. ...Yes, they do offer a trailer for you to live in for your 6 days a week job. But no phone, internet or TV -- you can add those! the listing helpfully says. They're being hailed as a "job creator" on their facebook page. So you spend a million bucks on the farm and a custom house, use kickstarter for capital (they just got $27k a week ago!) and you propose to pay a little over half the minimum wage for someone to do most of the work 6 days a week. That seems pretty fair, right? Nature's Harmony Farm produces award-winning farmstead and artisanal cheese from raw milk. We are located in Elberton, Georgia, a rural community about an hour from the bustling college town of Athens. Elberton has numerous restaurants, a Walmart (oh boy) and a coffee shop (and library) with high-speed Internet. This is an excellent apprentice opportunity for someone interested in dairy and cheesemaking, or just looking for a great farm experience. We are currently recruiting for a long-term apprentice or apprentice family to stay for a minimum of nine months, from September 2013 through June 2014. Longer is possible, but you need to commit to the entire season at a minimum. Housing provided in a self-contained 2 bedroom mobile home that can accommodate 2-3 apprentices or a small family. Accommodations include a kitchen, bath, one full-size bed and inflatable mattresses. Quarters do not include phone, broadcast television or Internet, although you can add those. There is a television provided with many movies from which to choose. You may put in your own garden if you'd like. We are open to children and pets for a long-term relationship, however, we do have livestock guardian dogs who are very protective of our farm, so you are responsible for safely securing your pets and children. We milk cows seasonally from October - July, so this opportunity is for the entire season. In addition to free housing and basic utilities, we pay a stipend of $400 per month. Contact us if you are interested. References and a background check are required. Tomorrow, 8-9-2013, there's a fellow who is auctioning off his 80 acre farm. No reserve. If a dollar is bid, that's what it will sell for. He's requiring a $20k earnest money from all bidders, but I have to say that this is either inspired or crazy. You'll find the auction notice here. I'm interested in seeing what this farm will sell for, as it's actually pretty comparable in size to mine; this one is 80 acres, mine is 70. This one has a house and barns, mine has a house and barns. I ended up paying around $6k/acre for mine. At the same number, this one should sell for $480k. I'll be at the auction tomorrow. If you're there, say hello. I'll be wearing a red cabelas baseball cap. Update: The farm sold for $815,000.00 That makes my $420k purchase look pretty darned good. the "boundary fence" - the old railroad tie with the sign on it. The western boundary for my new farm is a good example of that. I had the corners of the property surveyed and marked, and the survey itself was registered with the county. I did that because if you're putting up good fence, and paying good money for it, you want that fence to be in the right place, and more importantly, you want to know where your property lines are. If I put a fence up in the wrong place, the neighbors will tend to start thinking that the land outside of my fence is theirs; this happens more often than you'd think, and it's actually possible to lose your title to the land through adverse possession or related claims. So when I'm building permanent perimeter fences, I want to get it right. So survey it is. It takes a few years... or decades... for a T post to rust this way. Survey in hand, I approached my neighbor to the west, and let her know that I was going to fence along that edge. My western boundary has a county right-of-way easement, so my intention was the fence the property line, and then use gates to the easement to access my land -- that way I could plant to my property line, but be able to move equipment or supplies or animals in and out. My neighbor informed me that I was NOT to do that, and I was NOT to fence there, and that she would consider it trespass, and a couple of days later posted no trespassing signs and told me that she'd call the sheriff on me if I did trespass. And in fact she did call the sheriff one day. And she hired an attorney. So much for friendly relations with the neighbor! Her attorney got a copy of my registered survey, and looked at it, and apparently explained it to her that the land that she'd posted the no trespassing signs was actually owned by me, or by my other neighbor to the west, and that she was crossing that land via permit issued from the county; the "trail" permit, issued in the 1970s, allowed her to use the county right-of-way easement over my land to get to her property. I say my land because although the county has an easement over it, they never built a road, and I own the land to the center of the right-of-way. She has the right to cross it, but does not have the right to fence it, restrict my access to it, or post signs of any sort. He also informed her that the survey, my survey, showed that this fence that she had been pointing to, the boundary fence between her property and mine, didn't actually follow the property lines. In fact, over the 1000' or so of fenceline it traveled northwest, ending up about 50' onto her property. Now she's been pounding on this "boundary fence" idea for a while, and had actually found the guy who built it in 1968; said so in a letter her attorney sent me. County records, photographs mostly, show that fence in its current position since at least 1975 -- that's as far back as I checked. In fact, the age and condition of the posts confirm that this has been the longstanding fence between these two properties. Probably 40 years of rust. Her attorney noticed this, and sent me a letter stating that his client would "move the fence to the property line". Nope. That fence stays right where it is. What will move is the legal property line. When I purchased the property and walked the ground, I understood that to be the fence and boundary between our properties. And my neighbor understood that too, and repeatedly stated that to me and my workers, and helpfully found the people who built the fence decades ago. Adding that strip of land to my property will give me another acre or so of ground. Lesson? Fences can become your property line. Be careful where you put them. And surveys are good. If she had her land surveyed when she purchased it in 2009 we would not be having this argument today -- she could have probably moved the fenceline and been done with it. August corn & fencing for the 2nd time. The last two weeks have been very busy; put up about 2100' of perimeter fence and 15 gates at various places; stuff I did 7 or 8 years ago and doing it again. The first time I fenced I did so with field fence; purchased roll-ends off of craigslist, mostly from highway fencing projects. That fence lasted for a year or so, and in some areas I chose to do woven-wire fence, mostly on the recommendation of various horse owners. While it may be popular with them because horses can't kill themselves with it, it's not very good for areas that get a lot of traffic, or particularly good with pigs. It did last for 2 years. For high traffic areas, or areas where we'd be using the tractor to feed, I finally settled on a board fence. Not because it was cheap, but because you could repair it easily. 6x6 posts on 8' centers allowed you to pop off a broken board and replace it in a couple of minutes. 8' centers meant you could just buy a new board without having to cut it or measure; just knock the old one off and nail the new one on. I'm still fond of that sort of fence, and I'll be building some of that here. The biggest lesson I learned while I was fencing is that you can never have a gate that is too large. On this project my man-gates are 4' or 8' wide, depending on their use. The minimum gate opening for everywhere else is 12', with most gates being 14 or 16' gates. For the driveways I used smaller gates hung in pairs; a 16' driveway gets 2 8' gates, for instance. a 24' driveway gets 2 12' gates. I hang pairs of smaller gates because with a 6x6 post and enough concrete I can have the gate hang and swing properly without having either a wheel on the end of the gate or an overhead arch. I learned that while arches are good, having anything overhead of a gate opening can be a problem, so for this project there are no overhead obstructions, anywhere. the default wood post for this project is 6x6 treated posts. They last forever, and they are tough enough that they can take a hit from a tractor or implement and not break in half. Yes, you don't plan on hitting your fence with your tractor, or your gate post, but it does happen. I'm spending the time and money it takes to build a good fence because I learned that a good fence, and good holding areas, allow you to sleep at night. Having a secure area to put a balky pig or cow means that you can put the animal away while you deal with other things. For the holding areas that I've got now I'm installing automatic waterers with a trough backup for cold weather use. I don't know when I'll need the corral, but when you do you'll need it ready to go. I'm working hard during the heat of august because it's so much more pleasant to do fencing when its sunny and 80 degrees than it is in the pouring rain. We've got 7 months of rain and cold coming, but it's a matter of choosing where you'll be working when the rain starts. I have plenty of building-related projects to do, that I can do under a roof, and those will be the ones that I'll switch to after the fencing is done. The high tensile fence that I'm installing now is being set up to be electric, and that will be the final touch. I've been looking at voltage-indicating chargers, that show the load on the fence, and I'll be testing them to see if they work for me. It would be nice to have a display that I could look at to tell whether the fenceline needs to be cleared, or is grounded out. The dogs respect the wall-of-corn boundary. This is a five minute video that basically states my views on farming in the US. I'd like to hear your thoughts.